LAHORE: Raja – the hippopotamus, one of the oldest animals at Lahore Zoo – died late on Saturday. Shehzad said that for two days Raja had stopped eating. “He was under constant observation. On Friday night, Raja went into the pond. He just lay down when he came out and never got up,” the vet said. He said two zoo vets had checked him. A team of vets was also called from the University of Veterinary and Animal Sciences to assist them. “We did what we could to make the animal comfortable. We gave him a supportive therapy, checked his temperature and tried to help him stand up again,” he said. He died at around 1am. Raja was brought from Africa in 1974. It was 10 years old at that time. Rani, a mate for Raja, was brought in 2006. The pair, however, did not breed. Rani is now the only hippopotamus the zoo has. “We will try to get another male hippopotamus. Rani is still young,” said Kiran Saleem, an education officer at the zoo. 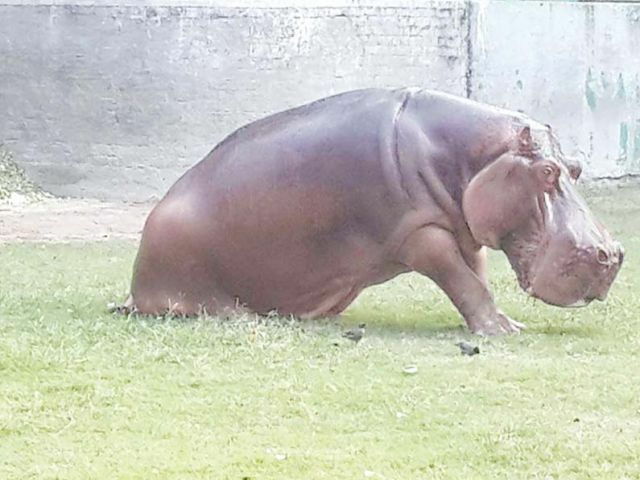 “As a child I always enjoyed looking at the hippo especially the way it would swish its tail around,” said Ayesha Imtiaz, who was visiting the zoo with her family. She said she was sad at Raja’s demise. The zoo administration also expressed grief over the loss. “Everyone at the zoo had cared for Raja at some point. We are deeply grieved,” said Saleem. Published in The Express Tribune, October 26th, 2015.